With its famous colour palette of black, blood red, gooey green, pumpkin orange and deep, dark purple as well as a whole array of creatures, beasts and spooky characters associated to it, Halloween is an amazing source of inspiration for jewellery designs that are a little on the dark side. In this blog post we feature 8 of our favourite Halloween inspired designs from an array of talented jewellery makers. We had so much fun putting this post together and finding so many creative and inspiring designs. We hope it helps you get your spook on and create something perfect for this time of year. These designs are in no particular order. 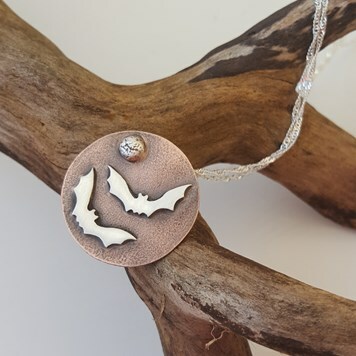 This gorgeous pendant by talented jeweller Anna Ancell is Halloween perfection. Made with neatly cut shapes from metal sheet and soldered on to a copper disc, the design itself is amazing enough. However we think it is the finish that makes this piece extra special with some nice dark oxidisation and a rough look texture on the copper. To view more of Anna Ancell's jewellery range click here. 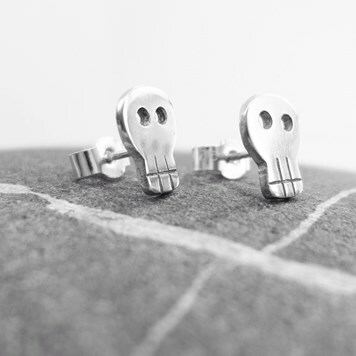 We love these cute earstuds from Collection 47 - a simple design yet so effective and the perfect little spooky touch. The precision needed to cut these tiny little skull shapes with a piercing saw out of metal sheet, as well as drill the tiny little eye holes is admirable! To view more designs from Collection 47 visit their website here or browse their Folksy here. 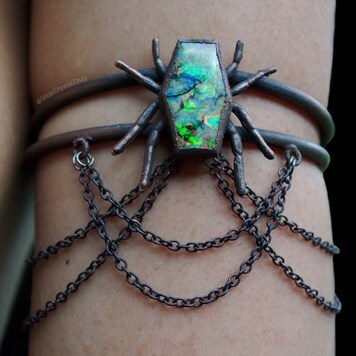 We are totally mesmerised by this opal armband from Shop Crystal Child. The design itself is so unique and the amazing colours of the opal stand out beautifully against the dark metal. This armband was electroformed with a thick gauge of copper wire with the addition of some copper chain. All metal has been finished with a dark patina for the perfect gothic touch. To view more of the amazing designs from Shop Crystal Child click here. We think this amazing silver swallow skull pendant by Lucylou Designs is such a gorgeous design with a real 'hallow' feel. The pendant is made using a real bird skull and cast with silver! 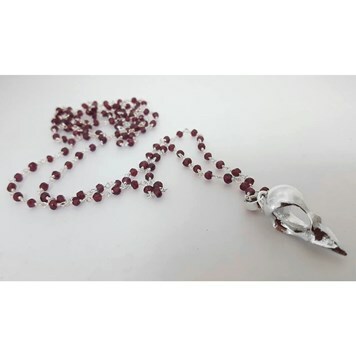 The addition of the blood red garnet bead chain is the perfect combination. To see more from Lucylou designs click here. The iconic Crossbones ring from Bloody Mary Metal is one of our all time favourites. 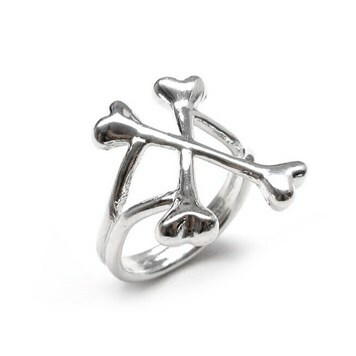 Whilst an everyday essential for most BMM fans, the crossbones ring would be ideal for anyone looking to add some halloween charm to their outfit this time of year. For more designs from Bloody Mary Metal check out their website here. 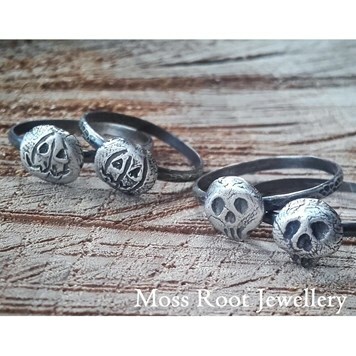 These cute little stacking rings by Cornish brand Moss Root Jewellery have such wonderful handmade charm with a spooky twist. Each ring is oxidised sterling silver and textured for an imperfect finish. We think this rough, dark finish combined with the charming design is what makes them unique and the perfectly themed halloween accessory. To view more designs from Moss Root Jewellery click here. 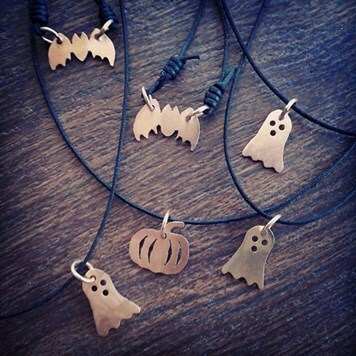 These copper and brass ghost, pumpkin and bat pendants by Nibinabe Studio instantly made us smile. Each pendant is hand cut with a piercing saw and hung on waxed cotton cord... a simple design yet all you need to show your love for this fun time of year. To view more designs from Nibinabe Studio click here. 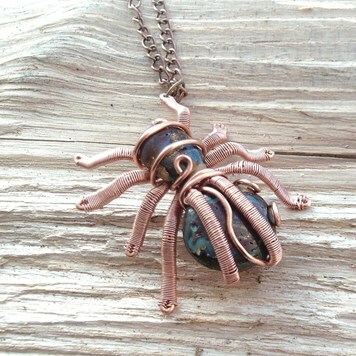 This amazing spider pendant is by Dragonfly Handmade Jewellery. It features beautiful boulder opals intricately wrapped in copper wire. If you are a lover of our 8 legged friends this would be a must have for any time of year but it is especially perfect for the weeks around halloween. To view more wire wrapped designs from Drangonfly Handmade Jewellery click here. 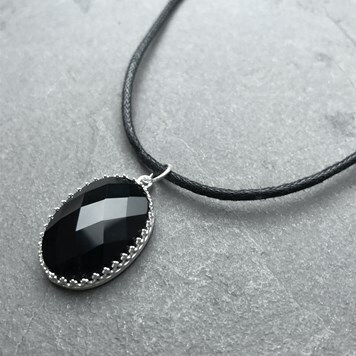 This Make The Look project features our sterling silver gallery wire pendant setting with a gorgeous black agate checker cut cabochon... a match made in... hell? We love incorporating large gemstones into our designs and the gallery wire settings make it so easy to do so. For step by step instructions on how to create this look click here.